Safety Training Seminars has been providing CPR, First-aid, and EMSA training to child care centers for over 18 years. We are able to teach CPR and First-aid classes at your site any time and day of the week, or we offer classes in our classroom in San Francisco. Our CPR instructors are very friendly, professional and knowledgeable. 5. STS is open M-F 9 am – 5 pm to answer any questions you may have. AB 243, the California Childcare Law, mandates that at least one staff member with fifteen hours of CPR, first aid, and preventative health and safety training be present in the childcare setting. Large centers prefer to train their entire staff in CPR & First-aid to be prepared for an emergency. However, it is not necessary to train the entire staff in EMSA CPR and First-aid. The law specifies that only one person is required to be trained in the full 16 hours of training. Many centers train 2-3 staff in the full 15 hours and then train the rest of the staff in basic CPR and First-aid. • EMSA Health & Safety: 7 hours, this course does not have an expiration date. Safety Training Seminars has been providing EMSA training classes since they started and we are very knowledgeable about these laws. If you have questions about compliance issues, certification, or EMSA, please call us or send us an email. We have received information that non-approved programs and/or non-approved instructors have taught classes without EMS Authority approval to train childcare providers. 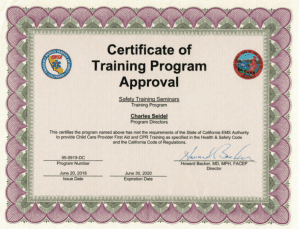 Anyone who has a pediatric first aid, pediatric CPR, and/or a preventive health course completion card issued by a non-certified training program or a non-approved instructor, must retake, and pay to retake, the classes from an EMS Authority approved program. A valid certificate for each course is required and must be obtained before you can work in the childcare environment. STS is able to teach classes at your site with a minimum number of 14 students. A lot of centers offer the training to the parents, since it is a great service. We offer you posters to help promote the class at your center and to help you reach the 14 person minimum. If you have less than 14 to train, we offer classes in San Francisco. How do I register for a group class? How do I register for a class in San Francisco? 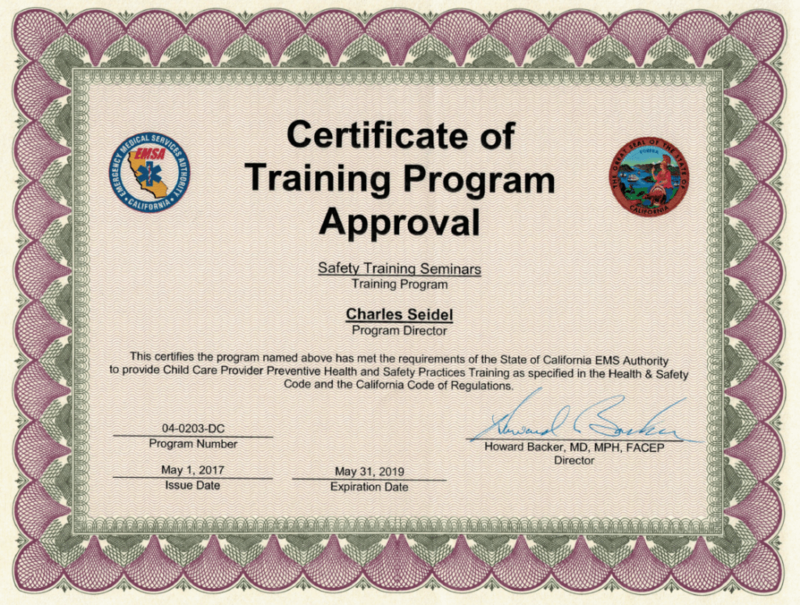 Safety Training Seminars is certified by EMSA to train childcare providers (Program number 0204-DC).